A still from the film, "Anna." Courtesy photo. The first major festival screening of “Anna” also garnered the film’s first award. 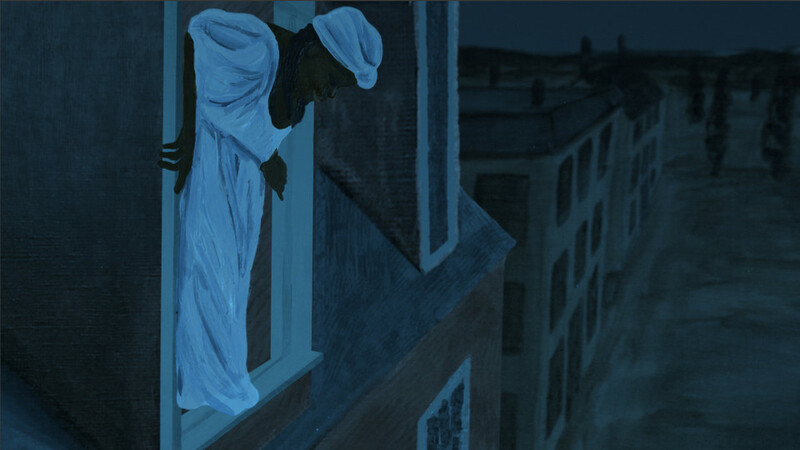 The University of Nebraska-Lincoln-produced film about one enslaved woman’s struggle earned the Best Animation award at the New Media Film Festival in Los Angeles June 17. Nebraska’s Michael Burton, Kwakiutl Dreher and William Thomas created the animated short, which took three years to complete. Burton, an animator and assistant professor of practice in textiles, merchandising and fashion design, and Dreher, associate professor of English and ethnic studies, accepted the award for the team. During the festival screening, Burton said he felt the film making an impression on the audience. attended the screening of their film, "Anna"
earned Best Animation at the festival. Dreher, the screenwriter for “Anna,” heard from audience members, too. The film is based on the story of Ann Williams. Williams was known only as “Anna” in abolitionist writings after she jumped from the third-story window of Miller’s Tavern in Washington, D.C. in 1815. Williams was attempting to escape the fate of being sold to another slave owner and separated from her husband and family. Historians have slowly filled in Ann’s story. Thomas’ research into court records from Prince George’s County in Maryland shed further light on her life. The film has created positive buzz since its January release online. Prior to the festival, Thomas traveled to the Washington D.C. area to show the film to several audiences including the Prince George’s County Historic Preservation Annual Awards Recognition Gala in Bladensburg, where Ann was from. “Anna” will show at more film festivals over the next year, and it is part of a planned animated series set in early Washington D.C., exploring the moral problem of slavery. Dreher and Burton pitched the series at the festival. Burton said the pitch was successful and that the series got the attention of a notable animation producer. Burton, Dreher and Thomas also are forming a production company in order to start development. “We are honored by the award from the New Media Film Festival and are excited to take the next step together and begin working on a series,” Thomas said. “Anna” was featured on Atlantic Selects, screened during the Hampton University Film Festival and has been selected for the 2018 Hip Hop Film Festival in New York City, August 2-5, 2018.